Apparently, they love Canadians in Las Vegas! Well, Canadians Do like to go to Las Vegas! Why wouldn't we? It's just a short flight away and there are so many deals to be found on-line these days. But, what sets us Canadians apart are our manners! We are very polite and the Americans, at least, the ones working in Las Vegas, love it. Everywhere I went, as soon as people find out I'm visiting from Vancouver is met with a chorus of 'we love Canadians'. Well, I love to visit Las Vegas, too. For me, it makes perfect sense. Where can you go that is not too far away, where the weather is always warm and sunny, where drinks are in abundance and at night you can watch as many theatre shows as you like. Let's not forget gambling, too! All the hotels in Las Vegas try to out do each other in décor and theme. I always start my day by the pool. You have to start early to find a shady spot. By noon when the sun begins to get hot, I retire to my room to change. Once I'm refreshed, it's off to check out all the hotels and to have a meal before watching a show. Las Vegas is supposed to be about gambling. At least, that's how it started out in the early days. Although gambling is still a major part of Las Vegas, it is now more about family fun, dining, shopping and watching shows. I have watched many shows at Vegas including Bette Midler, Donny & Marie Osmond, Tom Jones to name a few and that's not including all the Cirque shows or magic shows either! At the Venetian. This is the Canal Shopping plaza. On this trip, I watched the Penn and Teller Magic Show at the Rio Hotel. We discovered, much to our delight, that Penn Jillette actually plays Bass before the show. Check out my photo of him below. While I was in Las Vegas, the original Broadway cast of Priscilla - Queen of the Desert was playing at the Venetian. The musical is based on the original film The Adventures of Priscilla - Queen of the Desert starring Terence Stamp, Hugo Weaving and Guy Pearce. It went on to win an Academy Award for Best Costume at the 65th Academy Awards in 1995. The musical stage adaptation is fun with great songs and amazing costumes. It's a feel good musical that had all the audience clapping and singing along. I highly recommend it. The show is no longer playing in Las Vegas now as it was the travelling show. However, I was very interested to learn that Priscilla Queen of the Desert is currently showing in England, Ireland and Italy as well. 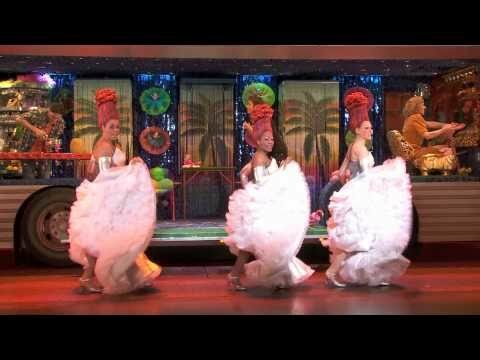 A Sneak Peek at Priscilla Queen of the Desert! Las Vegas for me is the perfect 'short' getaway! There's so much to do that you don't even have to gamble. Although, I am sure that's not the intent of the casinos! I try to stay at a different hotel each trip for a unique experience and watch as many shows as I can. To be honest, I have my 'Las Vegas' bag packed and ready for 'whenever'!